WLAN stands for Wireless Local Area Network. It is a small network consisting of Access Points and Stations. Access points are like Base stations and Stations are like clients or work stations or PCs or laptops. 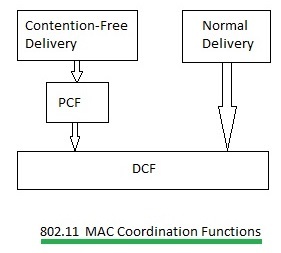 Both DCF and PCF are 802.11 medium access types. DCF stands for distributed coordination function and PCF stands for Point coordination function. In this page we will see difference between DCF and PCF medium access types defined in IEEE 802.11 WLAN standard. These are the mechanisms for the implementation of CSMA/CA in Wireless LAN. CSMA/CA refers to Carrier Sense Multiple Access with Collision Avoidance. Before we see difference between DCF and PCF; let us understand about carrier sense. The carrier sense refers to sensing of the medium by the station to know whether the medium is occupied by some other station or it is free to transmit. There are basically two mechanism to sense the medium. It is better to check both of the above mechanisms to determine idle state of the medium. NAV is basically a timer which is updated by the station based on the frame duration. Every 802.11 frame contains duration field. This field is usually larger enough to take care of transmission of WLAN frame as well as reception of ACK frame. 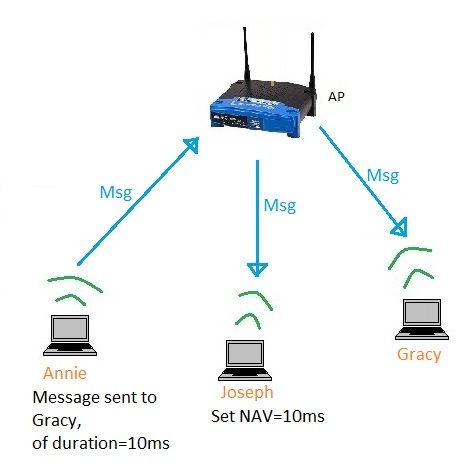 As shown in the fig-1, suppose Annie is transmitting a frame to Gracy. In this case, Joseph updates his NAV equal to duration of the MAC frame Annie is transmitting. Joseph also ensures that he does not transmit till NAV becomes zero. Pls. note that once NAV is set, stations can update it further provided frame duration exceeds currently set value of the NAV. If the frame duration is less than the NAV already set, it will not be changed/altered. The DCF is the basis of the standard CSMA/CA access mechanism. Like Ethernet, it first checks to see that the radio link is clear before transmitting. To avoid collisions, stations use a random backoff after each frame, with the first transmitter seizing the channel. In some circumstances, the DCF may use the CTS/RTS clearing technique to further reduce the possibility of collisions. Almost most of the wlan traffic uses DCF mac access type, this is because this access type is same as standard ethernet which provides contention based service. DCF makes it possible for multiple STAs to communicate without the need of central control. Hence it can be used in IBSS as well as infrastructure network type. As mentioned earlier, each station first checks for medium and transmits only when medium is idle. If the medium is not idle they will defer the transmission and employ simple exponential back-off algorithm in order avoid collisions. There are two main rules which can be applied for all the transmissions based on DCF concept. These rules are as mentioned below. • Transmission can be initiated immediately if the medium is idle for greater than DIF period. Carrier sensing is performed with both PHY layer as well as with NAV. -The medium is said to be free for at least the period equivalent to DIFS if the previous frame was received without errors. -If there was errors then the medium must be free for the duration equal to EIFS. • In the case when medium is occupied and not free then STA must wait till the channel become free or idle. Wait in 802.11 is considered as access deferral. In the case when access is deferred; the STA waits for the medium to become free for the duration equivalent to DIFS and will prepare for the exponential backoff. coordinators are used to ensure that the medium is provided without contention. Point coordinators reside in access points, so the PCF is restricted to infrastructure networks. To gain priority over standard contention based services, the PCF allows stations to transmit frames after a shorter interval. The PCF is not widely implemented. However, the IEEE designed the PCF so stations that implement only the distributed coordination function (DCF) will interoperate with point coordinators. Contention-free service is not provided full-time. Periods of contention-free service arbitrated by the point coordinator alternate with the standard DCF-based service.